The vibrant and spirited rock ‘n’ roll scene of San Antonio, Texas is spiritually and symbolically represented by the late Joseph Yanuzzi, known colloquially as Joe Anthony “San Antonio’s Godfather of Rock ‘n’ Roll.” A graduate of San Antonio’s Central High School, he began his career broadcasting on stations in small town Texas – San Marcos, Cuero, and Uvalde. By the late 1950s Joe Anthony returned to San Antonio as the evening disc jockey for KMAC 630 AM. It was here that Anthony labored to cultivate the burgeoning “West Side Sound,” a multi-ethnic and multi-racial Doo-Wop and Soul scene rooted in San Antonio’s West Side. The popularity of associated groups like “Charlie and the Jives,”” The Royal Jesters,” and “Doug Sahm and The Pharaohs” demonstrated the city’s ability to support a local music scene beyond the traditional Mexican Folk styles of mariachi, banda, and norteño. Attempting to capitalize on this energy, Anthony founded Harlem Records in 1959 where he cut a number of records with local bands. Selling his stake of Harlem Records, he then founded the short lived Hour Records with Charlie Alvarado of “Charlie and the Jives” fame. Despite these modest successes, by 1962 Joe Anthony left the label business and in 1966 stepped away from broadcasting. This decision signaled his broader disillusionment with the direction of the music industry and its increased catering towards audiences that were young, white, and more affluent. The move, however, proved temporary. 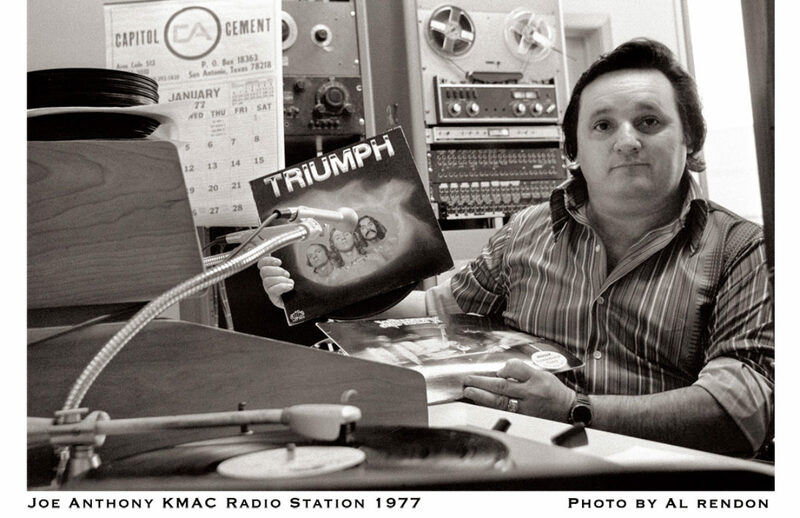 In 1968 Joe Anthony returned to KMAC, where he teamed up with program director and disc jockey Louis “Lou” Roney. A pioneering broadcaster in his own right, Roney’s partnership with Anthony transformed the character of KMAC from religious and agricultural programming to cutting edge rock ‘n’ roll, hard rock, and heavy metal. KMAC’s exposure of bands like Judas Priest, Kiss, Rush, Scorpions, Triumph, Legs Diamond, Thin Lizzy, and Aerosmith, contributing to their long-term success, is now established San Antonio lore. The station’s small market share and relative commercial isolation fostered a sense of anti-establishment rebelliousness, attitudes well paired with the music transmitted across the airwaves. Their unconventional playlists allowed Anthony and Roney to expose bands that would otherwise would get little or no airplay on San Antonio’s top tier AM stations. In an interview with Texas Monthly, Roney eschewed narrowly labeling their station one genre or another. “I don’t necessarily like the terms acid rock or heavy metal,” explained Roney. “Our playing the longer more arty cuts,” he continued “that’s what makes us different.” Whatever the labels, by the mid-1970s KMAC, and their FM affiliate 99.5 KISS, were true exemplars of free-form progressive rock radio. If Joe Anthony and Lou Roney delivered new and exciting music to their audiences, Jack Orbin, founder of Stone City Attractions, brought those artists to concert venues throughout San Antonio and Texas. Anti-censorship campaigner, low cost ticket advocate, opponent to industry mergers and consolidations – Jack Orbin founded Stone City Attractions in 1972 with only $500 dollars. One of the first gigs he promoted was the blues-rock band Krackerjack featuring a young and immensely talented guitarist Stevie Ray Vaughan. From there Stone City Attractions broke some of rock’s biggest acts, including AC/DC and Rush, in venues in and around San Antonio. The growing success of hard rock and heavy metal artists invited increased attention and scrutiny. Formed in 1984, the Parents Music Resource Center (PMRC) targeted hard rock and heavy metal artists over the nature and content of their album lyrics. Nine of the fifteen songs, known as the “filthy fifteen,” offered up by the PMRC as containing objectionable, violent, and perverse lyrics, came from hard rock and metal artists. In hearings before the U.S. Senate committee on Commerce, Science, and Transportation, witnesses testified on the questionable artistic and social merits of hard rock and heavy metal. One witness in favor of increased censorship, University of Texas at San Antonio music professor Dr. Joe Stuessy, characterized the music as a “scourge” and motivated by “hatred.” Undoubtedly, Dr. Stuessy’s residence in the self-identified “Heavy Metal Capital of the World” impacted the nature of his testimony. Nonetheless his perspective had allies among San Antonio’s City Council, which, on November 14, 1984, passed a controversial “rock ordinance.” The order prohibited unaccompanied minors, defined as one under the age of 14 not in the presence of their parent or legal guardian, from attending any theatrical or musical event deemed “obscene.” By obscene the council meant, “any performance where 70% to 80% of its content deals with sexually explicit lyrics or performance acts.” Other restrictions included smoking bans, which were instituted to curb what was perceived as the tolerance of marijuana usage in city venues. Mayor Henry Cisneros also highlighted certain band’s onstage display of occult and satanic symbols, sure to inflame the sensibilities of the city’s large Catholic population. Despite this opposition, the loyalty of San Antonio’s rock fans sustained the vibrancy of the scene though these times. Major label artists continued to tour the city, while a network of smaller club venues provided exposure for up and coming acts. The 1990s witnessed changes that began to inexorably alter the nature of San Antonio’s hard rock and heavy metal scene. In July 1990, 99.5 KISS changed its format to oldies for a two year period, temporarily severing the long standing link between the station and its listening audience. Though the Album Oriented Rock (AOR) format partially returned, now split alongside the rapidly growing “Alternative Rock” genre made popular in 1991 with the release of Nirvana’s Nevermind, the station’s previous identity was never fully restored. The tragic and unexpected death of Joe Anthony in September, 1992 represented another major blow. At the time working at KSAQ 96 FM, a competing rock station, Anthony’s sudden departure represented a major institutional and historical loss. If the city’s hard rock and heavy metal scene was to endure, it would have to do so without one of its deepest and most public advocates. Other difficult changes followed. In 1995 La Semana Alegre, a music festival affiliated with San Antonio’s annual Fiesta celebration and frequently hosting hard rock and heavy metal bands, was cancelled. The controversial move, motivated in part by negative press on the perceived unsafe and delinquent nature of the concert going public, is still remembered with bitterness. In 1996 the United States Congress passed the Telecommunications Act, a law that revolutionized radio station ownership and broadcasting. Prior to this, radio in San Antonio, as elsewhere, was characterized by a diversity of owners, disc jockeys, and playlists catered to the demands of the listening audience. Now stations, their staffs, and operations were consolidated under large corporate umbrellas – radio stations that were once proudly local were being programmed from hundreds of miles away. Today 99.5 KISS FM, while sharing the name and heritage, is managed by Cox-Media Group from Atlanta Georgia and bears only a scant resemblance to the station that existed previously. Current business models for radio and concert promotion have little incentive to prioritize local tastes. Some local radio DJs, inspired by and with historical connections to Joe Anthony, survived on for a time at the reconstituted 99.5 KISS or other local competitors. The long running class rock station 104.5 KZEP FM inherited a number, perhaps in an attempt to retain the known portion of the listening market. In 2014, however, 104.5 KZEP changed its format away from classic rock to “rhythmic contemporary” with classic rock tunes shunted to 93.3 FM. Yet this proved to be only temporary; the following year iHeart Media, KZEP’s owner, turned the station into a classic country format. Jack Orbin’s Stone City Attractions similarly closed in 2015. The veteran concert promoter attributed its closing to a variety of factors, including market consolidation, soaring ticket prices, and overall dissatisfaction with the business environment. He still believes in the role of local music promoters to identify and deliver on the tastes and attitudes of their communities. Such grassroots organizing, he has suggested, could led to a revitalization of once was a flourish hard rock and heavy metal community.